Great location. Easy access to dead sea. Friendly staff which went out of their way. Food was also good. Great location, lots of pools, beach access, large buffet for meals, comfy room with a terrace. Arrangeant, Tarek was clear he explains us everything about the hotel, deadsea.. It's a resort hotel and holiday inn did a very good job. The room is very comfortable and the staffs are very helpful. It's very isolated and quiet, but you have to eat in the hotel because the nearest town is still very far. the room was gorgeous and right on the beach, the meals had a good variety, staff was super nice and the hotel is great for kids with a kids pool..
Our room was really nice and spacious with dryer, amenities and free soft drinks in the fridge. We had access to the Sauna and Turkish bath for free, furthermore you have the private beach where you can benefit from the dead sea mud. Overall the experience was really great and relaxing. The rooms, all staff members, and the grounds were great. The spa was ok although very unprofessional not to be offered a drink prior to my treatments that included a full body massage, as this is very important to help detoxify. Also the whole spa experience felt clinical rather than holistic. 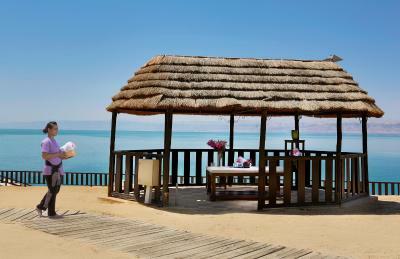 This Holiday Inn Resort, on the edge of the Dead Sea, offers luxurious facilities including a private beach area. Each room features flat-screen TVs and free internet. 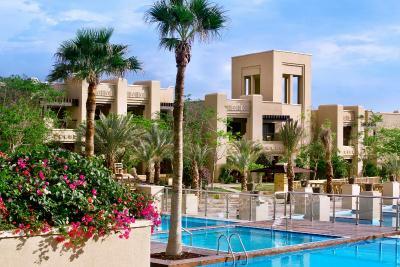 Holiday Inn Resort Dead Sea is set in a lush garden and has an expansive outdoor pool surrounded by sun loungers. There is also a sauna and hot tub in the hotel’s health club. Guests can unwind with a relaxing massage treatment. 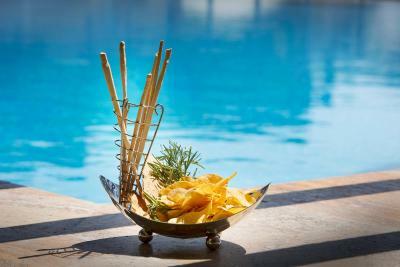 The resort has 3 restaurants and bars, including an all-day dining restaurant, a speciality steak house and a beach bar. 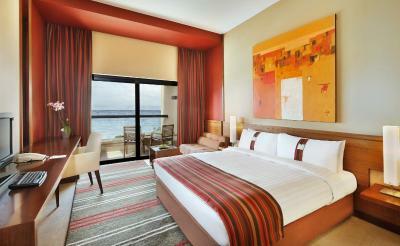 Guests can benefit from Holiday Inn Resort Dead Sea’s room service. Holiday Inn Resort Dead Sea has been welcoming Booking.com guests since 10 May 2010. When would you like to stay at Holiday Inn Resort Dead Sea? 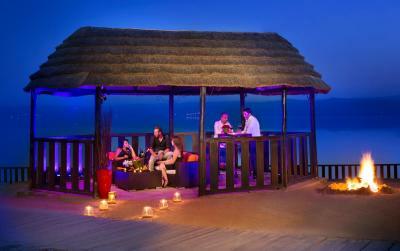 House rules Holiday Inn Resort Dead Sea takes special requests - add in the next step! Holiday Inn Resort Dead Sea accepts these cards and reserves the right to temporarily hold an amount prior to arrival. Room not clean enough, especially the bathroom. It was very annoying that the receptionist keep calling to make sure we leave 12 as they are fully booked?! Service at pool bar slow. Honestly, its not a cheap place and I would have expected more for what you pay. I would not recommend this hotel but would recommend anyone to spend a bit more money and enjoy the more luxurious hotels up the road which actually have way better service and personnel is better trained. They could really improve a number of things, including the overall service and hospitality. The man at check in was quite rude and very dismissive, even though we were kept waiting and he was on the phone half the time. He kept saying that they were 'fully booked' as if to excuse his poor hospitality - it was very obviously not the case as the hotel was half empty. Service at the pool bar is really quite poor, we had to return several times to ask where our drinks were. When confronted the staff are full of excuses and then offer a 'discount' which subsequently was not reflected in the bill. They have a bit of a typical attitude that its not their fault even though they do not remember orders. I would recommend that they write down orders if they cannot remember more than 2 drinks rather than make excuses or lie to guests. The service in the restaurants was slow - although the staff here were friendly I got the impression they were largely overwhelmed but trying. At breakfast there was one coffee machine working leading to lines of people trying to get a coffee- simple things like this are just annoying. Despite the 'fully booked' there were only 2 restaurants operational, which is a bit of a shame. The room was quite humid, not super clean but alright. Towels at the pool are not clean and have stains in them because they're also used at the beach with mud. 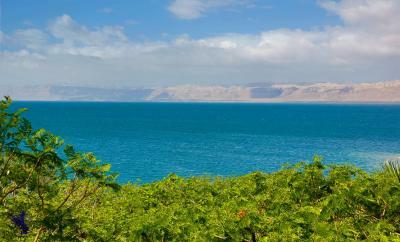 Location is nice, it is great that they have a beach for dead sea enjoyment. Breakfast is ok. There was no ATM. Aside from that this Holiday Inn was perfect. Staff, beach access, the food outside was great. I lost count of the pools! Very basic room. They wanted to charge us for water!!! Breakfast quality can be improved. No desserts in the evening restaurant and they didn’t care to bring it from another of their 5 restaurants. Room service was slow responding.